In support of the time honoured New Year New You tradition, I think you should pick up copies of Fearless and Fantastic: Female Super Heroes Save the World (DK Publishing, 2019) for every woman you love. 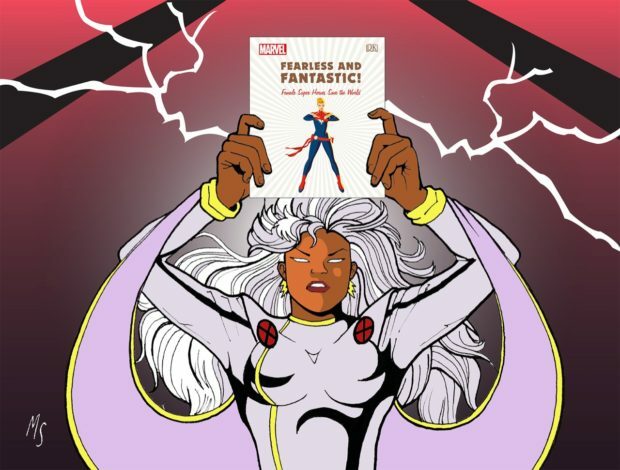 Fearless and Fantastic showcases 50 awesome female super heroes from the Marvel Comics universe guaranteed to inspire women and girls regardless of age, education or social strata. What’s extra inspiring: unlike lots of male super heroes these women use intelligence, strength, kindness and courage to save the day, and the world, not brute force. Just sayin’. Fearless and Fantastic curates the heroes (note: not heroines) into four chapters according to their personality: determined; daring; compassionate; and curious. Each hero may possess a combination of these character traits but their chapter speaks to their primary strength. Illustrated with comic book art from the Marvel archive, each bio shares the super hero’s backstory and an especially apt quote, and cross references their allies and role models so even if you’re new the super hero world, it’s easy peasy to sort out the interrelationships. As I flipped through F and F, I stopped at Scarlet Witch – she looked fierce and a little older than some of the other super heroes. Scarlet’s in the Curiosity chapter; her given name is Wanda Maximoff and she and her twin Pietro were first recruited by Magneto into his Brotherhood of Evil Mutants – this is where she morphed into hex-throwing Scarlet Witch. Scarlet and Pietro saw the error of their ways and crossed the floor to join the Avengers. Her quote? “Wanda Maximoff is in the room and she can speak for herself.” Gotta love it! If you’re not a vegan I bet you know people who are, and cooking for a mixed bag of eaters is not easy. Till now. 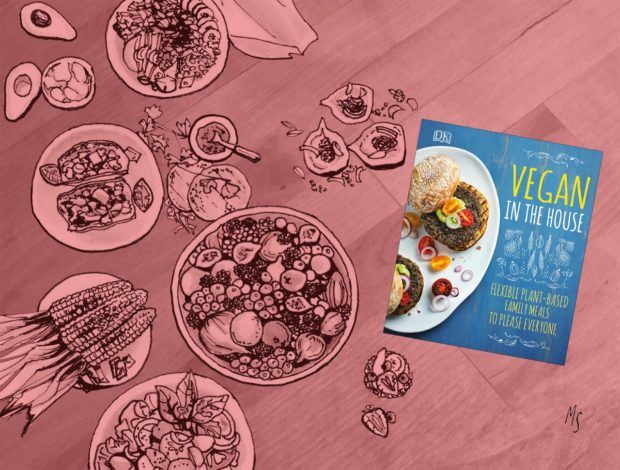 Vegan in the House: Flexible plant-based family meals to please everyone (DK Publishing, 2019) serves up more than 100 yummy vegan recipes for breakfast, lunch and dinner plus snacks, sides, salads and desserts. If you’re a new convert or cooking for a vegan, the upfront section busts some myths – eating vegan isn’t boring; offers tips for making sure you’re getting all the nutrients you need – did you know that one cup of buckwheat has one third of your daily protein?, suggests vegan substitutes – coconut yoghurt has probiotics; and tells you how to stock your vegan kitchen and maximize your freezer. But here’s what makes this a must-have on your cookbook shelf: instead of getting all judge-y at meat/fish/dairy eaters, Vegan in the House offers a Flex It tip to each recipe to entice non-vegans to the table. Brilliant. Boasting drool-worthy photography, Vegan in recipes are simple and easy to make – everyday food for everyone that’s also pretty darned tasty. You binge watch The Crown on Netflix, don’t you. And I bet you tuned into Harry and Meagan’s wedding, too, am I right? 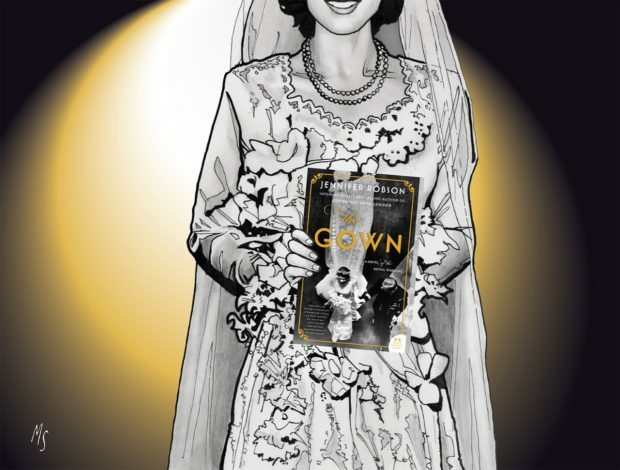 Then you’ll love The Gown: A Novel of the Royal Wedding, the latest from best-selling author Jennifer Robson, an engrossing historical novel about Queen Elizabeth’s wedding gown – one of the most famous wedding dresses ever – and the remarkable women who made it. London, 1947: World War II ended two years earlier but England, suffering through the harshest winter on record and with life’s essentials like sugar, tea and heat still rationed, is not a chipper place. When Buckingham Palace announces the wedding of Princess Elizabeth to the dashing Lieutenant Philip Mountbatten, the entire country hangs on every detail – kinda like we did with H and M’s nuptials – as a little bit of glamor in an otherwise bleak and dreary world. For working class Ann Hughes and Holocaust survivor Miriam Dassin, talented embroiderers at the famed fashion house of Norman Hartnell, the wedding is even more exciting: they have been chosen to create the extraordinary stitching that will grace the Princess’s wedding gown. Toronto, 2016: Heather Mackenzie’s beloved Nan has died and left her a large plastic box. On its lid, in black Sharpie, are the words For Heather. Inside: pieces of exquisitely embroidered and beaded fabric. And a picture of 22 women, including Nan, sitting around a table, dated London. Oct. 1947. Waiting for HM. Heather, a journalist, sets out to track down the provenance of the fabric pieces and discovers they match the motifs decorating Queen Elizabeth’s stunning wedding gown. Nan didn’t talk about her life before she came to Canada, so Heather travels to London to piece together who her grandmother was as a young woman, including her unlikely friendship with Miriam, now an internationally acclaimed artist, and in the process discovers herself. The Gown is an engaging story of strength, resilience and survival – and a celebration of the power of women’s friendships. Raina Anand is coming fast on 30. Sure, she has a high-powered job, good friends and all in all a pretty enviable life. But wait. She’s single, much to the dismay of her family. Hasn’t had a date in who knows how long. And she’s of Indian descent, so you know her beloved grandmother, Nani, is all over fixing her up with the eligible sons of her friends and her friends’ friends. Trouble is, Raina is still in love with her ex boyfriend, a globetrotting, super self-absorbed, A-type despised by Nani and Raina’s best friend Shay. Raina loves her Nani, so she dutifully agrees to meet all the men on the list but after more-than-too-many cringy blind dates, and with Dev, the ex, secretly back in her life, Raina tells Nani she’s a lesbian, hoping that will put an end to the matchmaking. But Raina’s lie complicates her life, pushing away the people she cares about most, not to mention messing up a maybe-relationship with a man – not Dev – she thinks she’s falling in love with. Sonya Lalli’s debut novel is high drama – OK sometimes a tad campy – but it’s also a sensitive exploration of culture, family and the challenge of pleasing the people you love without selling out yourself. Sophie Mackintosh’s astonishing debut novel is a slow, meandering and often dreamy tale of three sisters – Grace, Lia and Sky – who live on an isolated island with their parents, Mother and King, who have been raised them to fear men. The outside world, say Mother and King, is toxin filled and the men who live there will hurt women, perhaps kill them, in willful, masculine disregard. So King has strung barbed wire around the perimeter and anchored buoys in the bay, as clear a message as a sign reading Do Not Enter. Or, perhaps, Do Not Leave. There was a time when women, escaping the physical and psychological damage from men on the mainland, had come to the island to heal and their stories helped shape the sisters’ world view, but for some time now it’s been just the five of them. Mother and King devise all sorts of cruel therapies to keep the toxins at bay and teach the girls strength and endurance: the sisters wear white cotton dresses weighed down with fishing sinkers sewn into the hem, sleeves and neckline and King holds them under water until they’re one breath away from drowning; they’re sewn into sacks and left to “sweat out the bad feelings” in the sauna until they faint. One day, King disappears, presumed dead. Not long after, two men and a boy wash up on the beach. The girls are both repelled and drawn to the men and over the next week, they begin to understand that their lives have been controlled by a man who doesn’t like or trust women much, who takes pleasure in exerting male privilege and who fears losing control, and with King gone they discover that their bonds to each other, not Mother or King or barbed wire, have the power to keep them safe. 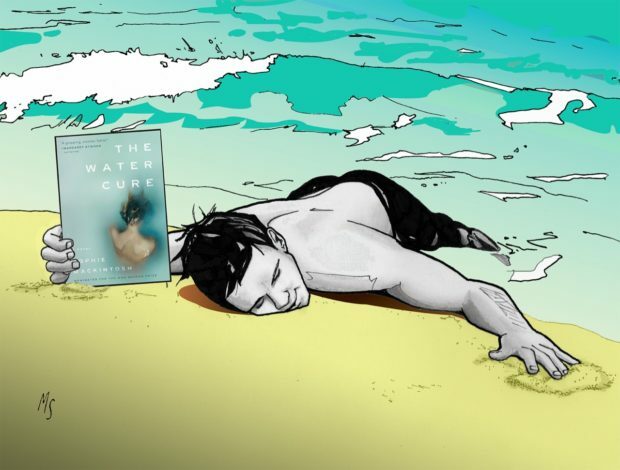 The Water Cure is not an easy book – it sometimes channels The Handmaid’s Tale but the storyline cuts deeper and closer to the bone. 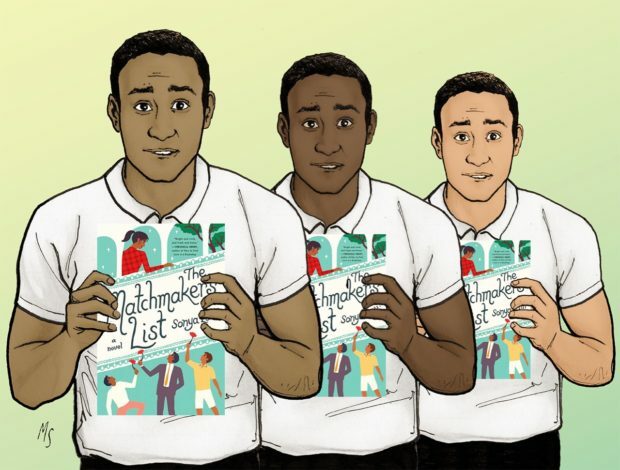 If you belong to a book club, put this one at the top of the must-read list.